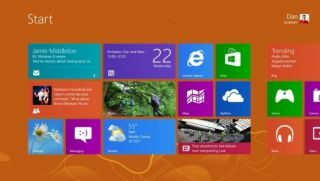 Windows 8 has been available for little over a year and, while not the success Microsoft had been hoping for, the operating system is a feature on most new laptops and desktops, and now tablets. What business doesn't rely on communications? Communications tool Skype has grown from its roots in voice over IP, and for Windows 8 offers instant messaging, voice calls and videoconferencing. It also takes advantage of the Modern user interface to give it a fresh look rather than that of an old Windows program. It can be docked at the side of the screen so you can take calls while working on that killer presentation. The business case for adoption is that telephone bills can be a major expense for businesses, and Skype can help you contain costs while maintaining contact with important business partners. Box for Windows 8 is a cloud storage app that provides access to important files in the cloud from multiple devices. OK, so Microsoft hands out 7GB of free storage to Windows 8 users, but Box is made for business. The service has many enterprise-friendly features and a 99.9% uptime guarantee. It also sports full text search, document collaboration, Salesforce.com integration, and restorable version histories. It can be used across multiple devices and IT will be happy to have the proper security and administrative controls so information doesn't fall into the wrong hands. Evernote is a productivity app that enables you to take notes, pictures, voice memos and data and store them in one location. It can really help business people who like to keep notes, memos, files and other data together in one folder. Notes are searchable and can be relocated later if needed. Data can be stored in different notebooks in the app so you can stay organised. If you data gets into a mess it can seriously affect your business, and this app helps you to stay on top of your work. You can also access files from various devices. A remote desktop that allows you access to office computers to troubleshoot problems on the move. IT managers often have to deal with computer problems, access files they may have forgotten on their desktop from their home office, or even assist colleagues with work-related tasks. This will save your IT guy many hours of travelling to fix computer issues. Formerly known as YouSendIt, Hightail helps business send those really large files that email clients cannot handle. Anyone who has had to email a really big PowerPoint presentation or Excel spreadsheets will know the frustration of getting an error message in their email client telling them the file is too big. Hightail uses the cloud to transfer files that are much larger than the average attachment, with a maximum size of 2GB. For monthly subscribers, there is an unlimited amount of data that can be stored and sent using the service. All data is also encrypted with 128-bit single socket layer and you can employ password protection for individual files. RNG Labs LockIt is a security app that remembers your passwords for individual applications and cloud services, a demand that can be damn near impossible for most people. LockIT stores passwords, credit card details and bank information in a secure location using military grade encryption. It will also synchronise this data across a user's other Windows 8 devices and import data from other password managers. The big case in its favour is that having passwords and confidential data securely stored somewhere is better than writing it all down on a scrap of paper. A PDF annotation tool that provides a quick way to make notes on PDFs. This app allows you to make annotations on PDF documents - adding notes, highlighting and underlining text. The Windows 8 touchscreen makes it possible to do this with fingers, a stylus or keyboard, and the annotated documents can then be saved and viewed in other apps. Annotating documents online can be a lot less time consuming that printing them out and making notes. As these notes can also be shared online, this can increase productivity for anyone that that needs to review files quickly and make changes. If you're eager to know Microsoft's got in store for Windows 8.1, take a look at our hands on review.